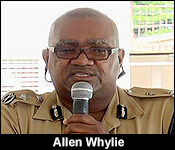 Police surveillance and monitoring of crime hotspots has taken a leap forward. One police officer in a room can zoom up close and see - with high definition clarity - what's happening on a corner four hundred feet away, or they can monitor traffic in the center of the city, and zoom in on a license plate or a person of interest. And at night there is infra-red vision with surprising clarity. The controller can monitor one area or all at once. All controlled with remote ease using this joystick. "Having this camera will give us a greater capability in law enforcement activities." 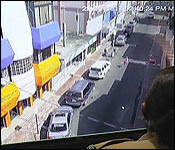 "We saw the need for getting a camera surveillance system up and running as a necessity for us to be able to effectively combat the crime situation particularly on Southside Belize City." For that Williams had to roost around for sponsorship. "I wrote a letter to the various business community requesting the donation, explaining to them the reason for the request and I can tell you that as they read the letter and saw what it was about, they were quickly to respond to our request." 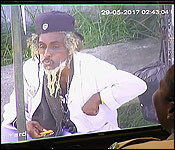 He hopes to get 6 cameras, but the response was so good, he raised enough funds for a 12 camera system that cost 135 thousand dollars. This is it, perched high above traffic - high enough to keep it safe, and to see a panorama around it. Each camera costs 5 thousand dollars for the unit itself and 9 thousand installed. "We have 11 soon to have 12 and no it is not enough. We have focused on the areas that we know were more problematic - the priority areas and we are hoping that if the Embassy comes through with the additional 16, we would be able to put in additional key areas." "These cameras will definitely be an additional tool in our crime fighting evidence gathering apparatus." "We are optimistic that with this system in place, the footage from them can be use in the courts to secure convictions against persons who are accused of committing crime and it will also aid our investigators on successfully investigating these offences. Over and over we hear the talking that the police need to improve investigation, but I can tell you we do have good investigators. What we need is more citizens cooperation in investigating crimes and since that is lacking, the camera system will assist us in ensuring that we get what we need." "How do you ensure it does not lead encroachments upon the privacy of citizens in their homes or in their yards?" "It has a lot to do with the ethics of the officer who operates the camera. The system is not here to go into the house of people. It is here to be able to monitor the streets and we have implore upon them that they are not to use the camera for any improper purpose. 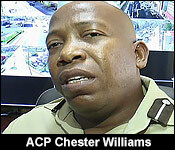 There is protocols in terms of how the camera is to be operated and we trust that the officers who we have carefully selected, because we didn't take any officer, we look for those officers who we believe are quite capable, those we believe will be able to maintain confidentiality to ensure that they are the ones who operate the camera." 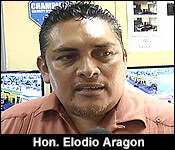 "We have catered for a 911 integrated system, along with 100 cameras for Belize City. These are things already in plan. What you see here today is just the start of things to come." 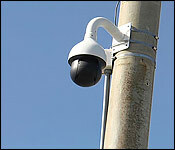 The system was installed and designed by Champion Security. So, the first 12 cameras are in - and they are all on the southside. Police hope that the US will provide funding for another 16 - which can just be added into this system. 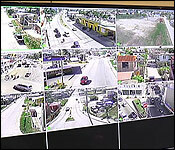 But then, a CABEI security project is coming online next year and that should provide 100 cameras for complete coverage off crime hotspots and escape routes.